Whether you have straight, curly or short hair, now learn to make a cool hairstyle in a jiffy, be it for formal or casual events of life! Overslept? Had a late night? Kids giving trouble? There have been times when I have hit snooze only to awaken fully freaked out. Moreover, summer is the perfect time for you to try out a unique and an equally innovative hairstyle. But with a million responsibilities, last minute change in plans and work commitments, I’m sure you wouldn’t have time to stand for hours in front of the mirror creating a different hair look. Now, don’t give up on yourself, and stop behaving lazy, because I have got you a reason to think differently. Here are a few quick hairstyles I learnt to make in less than 5 minutes. They come to my rescue from time-to-time. So, no need to panic! Zuri brings to you 12 amazingly stylish hairdos that can be done really quickly. Moreover, they are easy-to-do and apt for all hair lengths, types and textures. Besides, you can wear them to work, or after-work parties. Even a pre-bridal function or a wedding for that matter can be attended without having to worry about fixing an appointment with the hairdresser. Here’s how to style your hair in five minutes or less..
You can wear braid long hair into a ponytail or tuck shoulder-length hair into a headband, add a few curls to short hair length, turn a side braid into a low bun (that’s if your hair isn’t too heavy- texture or volume-wise), intertwine three braids into a high ponytail, pin one side and curl the other, use headgears- such as a bandana, scarf or a hairband to straighten out those frizzy strands on a particularly bad-hair day. And if that doesn’t work, throw on a headband and push it a little past your hairline for a sleek look. Ladies! There is so much you can do with your hair. 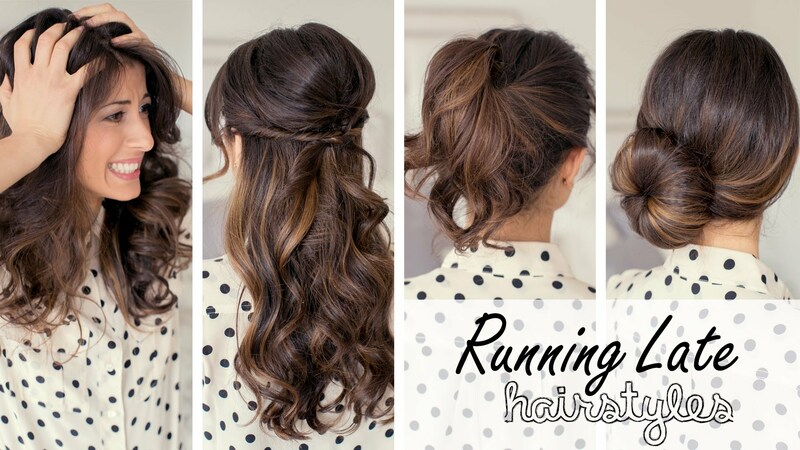 If you are a fan of complex, structured hairstyles, then, separate your hair into 4 sections and make a bun or a ponytail after having pinned them up with gorgeous hairpins. ← 7 Gorgeous dot and line nail art designs to flaunt!